Class President Addison Zeisler speaks at the graduation ceremony on June 5. 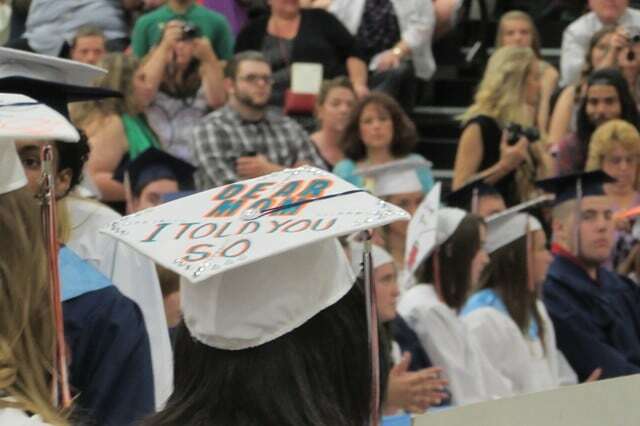 Galion High School sent another pack of Tigers on to the next chapter of their lives on June 5. Friday night’s graduation commencement saw 126 seniors get diplomas, including two members that were competing at a state track meet in Columbus. Superintendent Mark Stefanik asked the Class of 2015 to travel back in time to 15,000 educational hours ago: The first day of kindergarten. He told them to think of all the knowledge they gained, the experiences lived and all the people who positively impacted their lives. “You should be impressed by all that you’ve accomplished. We are all impressed,” he said. Class President Addison Zeisler reminded her peers that the night was not just about them, but about all those who helped them to reach this milestone. “We would not be here without the support of the community, our teachers and our families…They gave us opportunities. They nurtured, encouraged and challenged us,” Zeisler commented. Zeisler was later named class valedictorian. Evan Huggins earned class salutatorian. Colleen Conry, ‘80, was the keynote speaker. She discussed her career path and how her decisions got her employed as an attorney with the U.S. Department of Justice. Conry explained that she wanted to see what was beyond Galion, and her career has taken her across the globe to help with trials and investigate major corporations. However, she noted that is not for everyone, and told students they can have a wonderful life in Galion. She called the Class of 2015 part of the generation that will drive social media in a new direction, the generation of (Jimmy) Fallon, not (David) Letterman. – There is no substitute for hard work and perseverance. – Find your passion and follow it. – Learn from your mistakes. – Call your mom and dad in the years ahead. Board President Jennifer Kuns told the graduates that the evening was a celebration of their journey, a farewell and a beginning. “Set new goals. Dream new dreams,” she told them, before encouraging them to bring their talents back to Galion. Members of the class earned a collective total of $1,108,000 in college scholarships and an additional $370,650 in local scholarships. Also, 30 percent of them took early college courses, saving a total of $150,000 in tuition. Five students have already earned an Associate’s Degree: Alex Barker, John Finch, Mariah Gambill, Sara Trespel and Evan Zumbro. Click here to see our photos from the ceremony.